Warm spring days with lots of sunshine are a welcome sight after a long, gray winter, but the weather can change on a dime and go from pleasant to dangerous when a severe thunderstorm starts to develop, as they do quite often this time of year. Tornadoes in the United States occur most often in “Tornado Alley,” a swath of land that bisects the country: southern South Dakota, Nebraska, eastern Colorado, most of Kansas and Oklahoma, and the panhandle area of Texas. Many other states in the Midwest, including Ohio, experience tornadoes frequently throughout the season as well. Most twisters move from southwest to northeast, or west to east. Most last less than 10 minutes. Tornadoes move counterclockwise in the northern hemisphere and clockwise south of the equator. While hurricane gales range from 74 mph to 155 mph, the more concentrated, swirling winds of a tornado range from 40 mph to 318 mph or more. About 1,000 tornadoes hit the United States per year. On average, tornadoes kill about 60 people per year, most from flying or falling debris. The largest tornado-related loss in U.S. history was in May 1999 when tornadoes and storms struck 18 states, including Kansas and Oklahoma, inflicting $1.6 billion in damage. Tornado probability graphics, including distribution during the year, can be found at http://www.nssl.noaa.gov/hazard. Know the signs of a tornado: Strong, persistent rotation in the cloud base; whirling dust or debris on the ground under a cloud base (tornadoes sometimes have no funnel); hail or heavy rain followed by either dead calm or a fast, intense wind shift (many tornadoes are wrapped in heavy precipitation and can't be seen); loud, continuous roar or rumble, which doesn't fade like thunder; small, bright, blue-green to white flashes at ground level near a thunderstorm (as opposed to silvery lightning up in the clouds). These mean power lines are being snapped. Contact your agent, broker or insurance company and report your loss as quickly as you can. Have your policy number handy as well as specific information about the damage involved. Jot down the claim adjuster's name and phone number. Be careful when entering damaged areas. If there is extensive damage to your house, contact local government officials to determine whether your house is safe enough to enter. Report downed power lines or gas leaks to your utility company. Keep electricity off if your house has been flooded. Protect your property from further damage. Board up windows and salvage undamaged items. Ask your insurance company what they will pay for when it comes to protecting your belongings. Make a written list of damaged items, but don’t dispose of them until the insurance adjuster has examined them. Photograph or videotape the damaged items. Gather together any available receipts for the items. Keep all receipts for hotel rooms, meals, and any clothing or personal items purchased while your house is being repaired or rebuilt. Complete and return your claim forms. After you contact your insurance company to notify them of the damage to your home, you are required to send your claim forms within a certain number of days, which varies from state to state. If you're not able to live in your home, you'll likely get an immediate advance payment, which will be a check against the total settlement amount. Once agreements are met on the value of the property, additional checks will be issued. If you have a mortgage on your house, the IBHS says the check for repairs to your home will usually be made out to both you and your mortgage lender. Lenders generally put the money in an escrow account and then pay for the repairs as the work is completed. Contact your lender to discuss the contractor bids and details of the repair process. IHBS says homes typically are constructed to withstand speeds up to only about 70 miles per hour with weaker parts prone to damage at slower wind speeds. IHBS recommends improvements if you live in tornado-prone areas. Install "impact-resistant" window systems and impact-resistant laminated glazing materials for sliding glass doors. Replace door frames or reinforce them, and install well-anchored and dead-bolted entry doors. If your garage door is more than eight feet wide, retrofit it with stiffeners and stronger tracking systems to resist higher winds. Use a roofing system designed to withstand high winds and that includes well-sealed sheathing (to prevent wind and moisture intrusion) and braced gables. Firmly anchor the points where the roof and the foundation meet the walls of your house. For two-story homes, the upper story should likewise be firmly anchored to the lower framing. 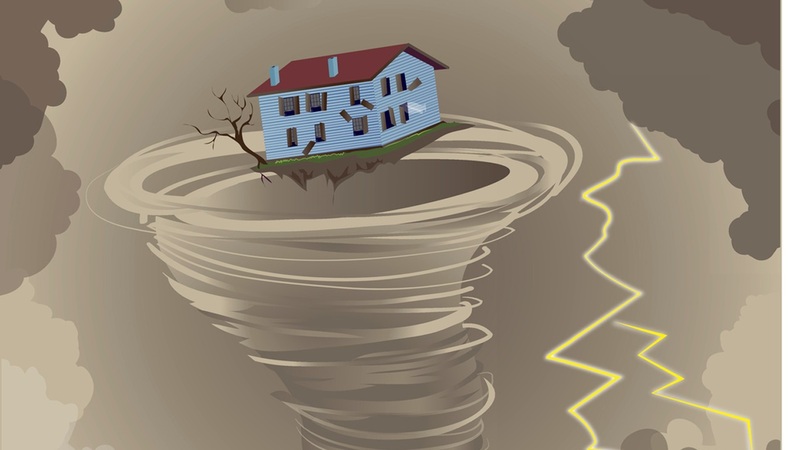 If your area is especially tornado-prone, you might consider preparing a sturdy "safe room," which costs approximately $3,000-6,000 in a new home and $3,600 - $7,200 to retrofit an existing home. However, HUD’s special Federal Housing Administration-insured loans can allow you up to $5,000 in added-on financing to cover the cost of building a wind shelter. Stay safe this spring/summer! If you have a home to sell or need to purchase your next dream home, don't hesitate to contact us, The Poss Team, at 614-431-0414 or email us at thepossteam@mindspring.com for help.